I've been using both the new Firefox 4 and Internet Explorer 9 for a couple of weeks now give or take. There was also a new version of Google Chrome 11 released recently too. So far, I have decided to stick with Firefox and Internet Explorer. I have enough Google in my life and for the time being I don't think I need anymore. I have been a huge fan of Firefox for as long as I can remember now. The free addons available are just amazing. I am normally not a fan of Internet Explorer, but seeing as so many other people do use it as their primary web browser I figure I should keep it around for testing web sites. 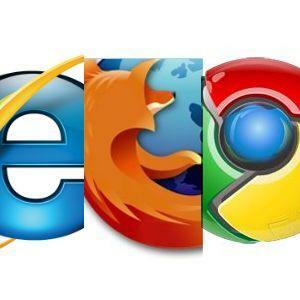 Both web browsers have pushed new features, increased speed and performance. Which, is noticeable with both. The new extra features I can live with or without. I really don't need a bunch of fancy bells and whistles, but whatever. Since upgrading in the past 2 weeks Internet Explorer has crashed 1 time so far. I hope that isn't a sign of what to expect as time goes by. I really don't have much faith in it, but I'll give it more time to prove or disprove itself. Firefox has not crashed in the same time period. However, like the previous version or two it has a definite problem with memory usage and consumption. The Mozilla folks have a tendency to blame this on 3rd party addons, plugins, and software people install for Firefox. They will tell you to disable or remove these until you find the one eating up all the memory. In my case it doesn't matter. Firefox just chews up the memory and continues to build until I close it out and restart the whole thing. After it starts back up memory use is fairly low. The moment I start browsing web sites it shoots right back up. I am talking 250 Mb's to 500 Mb's of memory just for Firefox alone. With an average use within a couple of minutes of about 300 Mb's to 350 Mb's. Internet Explorer seems to do a much better job at handling memory and releasing it. I really don't think a web browser should be using anywhere near this much memory. Browsing the same sites/pages with Internet Explorer 9 the memory usage is at least half of what Firefox is using. Sometimes much less than half. I love Firefox, but I am getting tired of restarting it 100 times per day just to free up memory and reduce the choppiness when memory usage gets out of hand. I don't see myself as converting to Interent Explorer as my primary browser, but heck you never know. Either that or I may let a little more Google into my life and start using Chrome more. Firefox is almost essential for administering a Boonex Dolphin based website, so I pretty much need it. But, the way it is going it may become my secondary web browser in the near future if Mozilla doesn't put out a more optimized release.